The Hodnett family Web Site at SedgwickResearch.com. As information is gathered and processed, it will be added to this site. Be sure to visit FamilySearch for Hodnett family pedigree charts and family group information. For questions, comments, or additional information, or if you have any information that you would like to see added to this site, please write to postmaster@sedgwickresearch.com. Hodnett Family History: This site, authored by Linda Hodnett, is one of the very best Internet sites on the Hodnett family. This site information about early Hodnetts, including John Hodnett, who was one of the first Hodnetts to come to America, and Benjamin Hodnett who fought as a soldier during the American Revolution. Hodnett Genealogy of Virginia: SEVERAL Hodnett family records posted on the Pittsylvania County, Virginia, Gen Web page. Hodnetts in the American Revolution 1775-1783: Some Hodnett Revolutionary War veterans are listed on this Culpepper family site. Benjamin Hodnett's Estate Papers: Located at Linda Hodnett's site. Samuel Hodnett's Alabama Land Record (partial transcript of patent): From the Arkansas Land Records of the United States Bureau of Land Management. Scanned image of the original land patent, dated March 15, 1839, in Adobe Acrobat Format (.pdf). Adobe Acrobat Reader is required for the pdf version and can be downloaded here for free. Samuel Hodnett's 1860 Federal Census Image: (courtesy of Ancestry.com) In order to view this file you will first need to download and install the MrSID plug in for your web browser. Click here to download and install the free plug in. After you install the free plug in, you will need to download the census image and save it to your hard drive. You can then open the file and view it with your browser. Speculation About Lafayette Hodnett: We do not know very much about Lafayette, but this document tells what we do know about him, and contains some speculation about how he lived and died during the Civil War. Lafayette Hodnett's Arkansas Land Record (partial transcript of patent): From the Arkansas Land Records of the United States Bureau of Land Management. Scanned image of the original land patent, dated July 1, 1859, in Adobe Acrobat Format (.pdf). Adobe Acrobat Reader is required for the pdf version and can be downloaded here for free. Lafayette Hodnett's 1860 Federal Census Image: (courtesy of Ancestry.com) In order to view this file you will first need to download and install the MrSID plug in for your web browser. Click here to download and install the free plug in. After you install the free plug in, you will need to download the census image and save it to your hard drive. You can then open the file and view it with your browser. 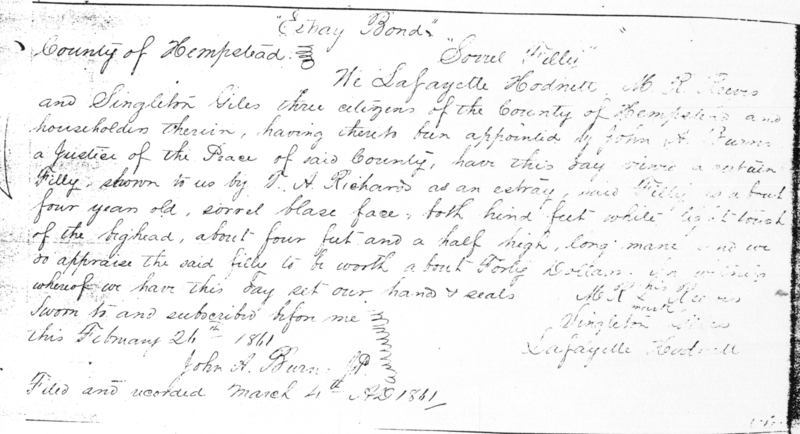 "Estray Bonds" Hempstead County Arkansas: A scan of a photocopy of an 1861 document regarding a stray horse that was signed before the justice of the peace by Lafayette Hodnett and others. 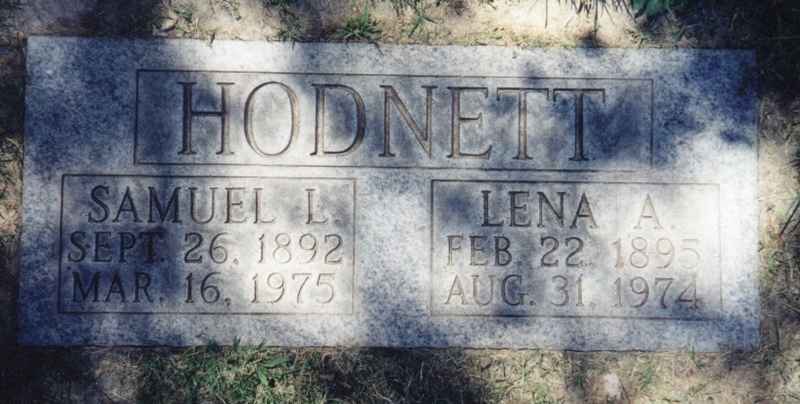 Lafayette Hodnett was the son of Samuel Hodnett, and the grandson of Benjamin Hodnett. He was killed during the Civil War. Photograph of Mary Ann Cooper Hodnett Johnson: Mary Ann was the wife of Lafayette Hodnett. After Lafayette's death, she married William Hiram Johnson. This photograph was provided by James Hodnett. Marriage Announcement for William H. Johnson and Mary Ann Hardnett (Hodnett--they just misspelled it): Mary Ann married William after her husband, Lafayette Hodnett, was killed in the Civil War. To find the announcement, click on the link above and then scroll down to the record for William Johnson and Mary Ann "Hardnett." 1880 Federal Census Record for the family of Mary Ann Cooper Hodnett Johnson (widow of both Lafayette Hodnett & William Hiram Johnson): This record, located at FamilySearch.org, lists all of Mary Ann's children who were still living with her at the time the census was taken. Included are Mary Ann (herself), James L. Hodnett, William H. Hodnett, Samuel M. Hodnett, Thomas E. Hodnett, Nancy C. Hodnett, Mary E. Johnson, Susan M. Johnson, Florence J. Johnson, Charles W. Johnson, Albert L. Johnson, Sarah F. Johnson, and Martha A. Johnson. Mary Ann's son, George W. Hodnett, is not listed, and may have passed away before 1880. George is, however, listed in the 1860 census. Photograph of James Lafayette Hodnett: James was the oldest son of Lafayette and Mary Ann Cooper Hodnett. This colorized photo was provided by James Hodnett, a descendant of James Lafayette Hodnett. Thank you James! Photograph of William Henry Hodnett and Rhoda Hannah Deaton Hodnett: William Henry Hodnett, born 1857, was the second son of Lafayette and Mary Ann Hodnett. 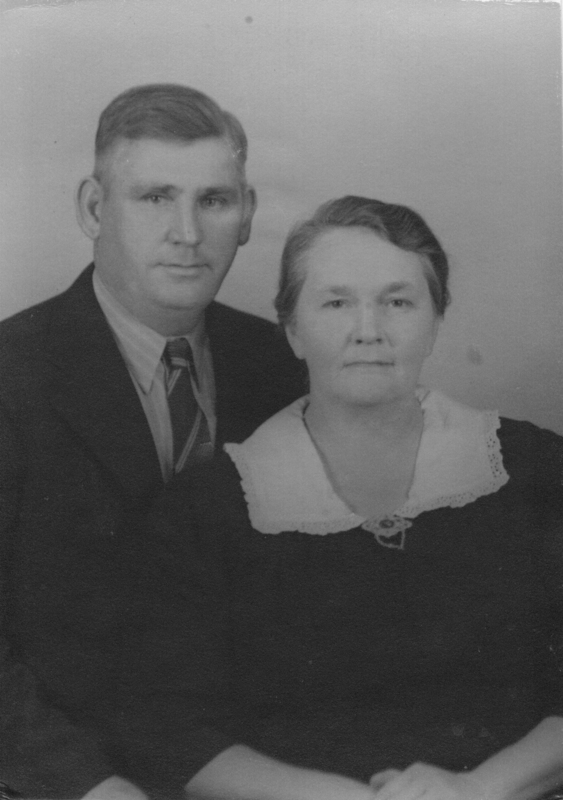 A picture of William Henry Hodnett's daughter, Illa Estelle Hodnett, and her husband, Henry Bert Cassidy, can be found by clicking here. Both of these photos are located at Terry & Regena Whitten's Web site. 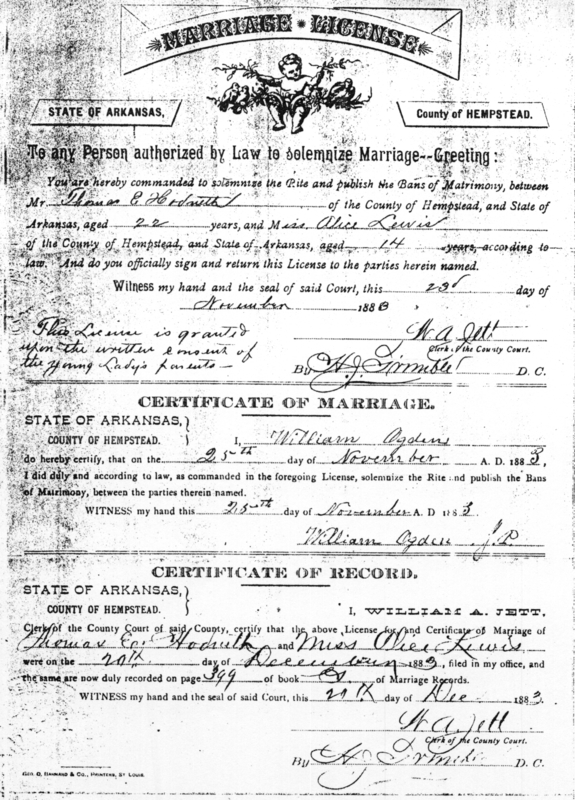 Marriage License of Thomas Edward Hodnett and Alice Lewis: This is a scan of a photocopy of the document. Thomas (born November 14, 1861 in Sardis, Hempstead, Arkansas) is the youngest son of Lafayette and Mary Ann Hodnett. 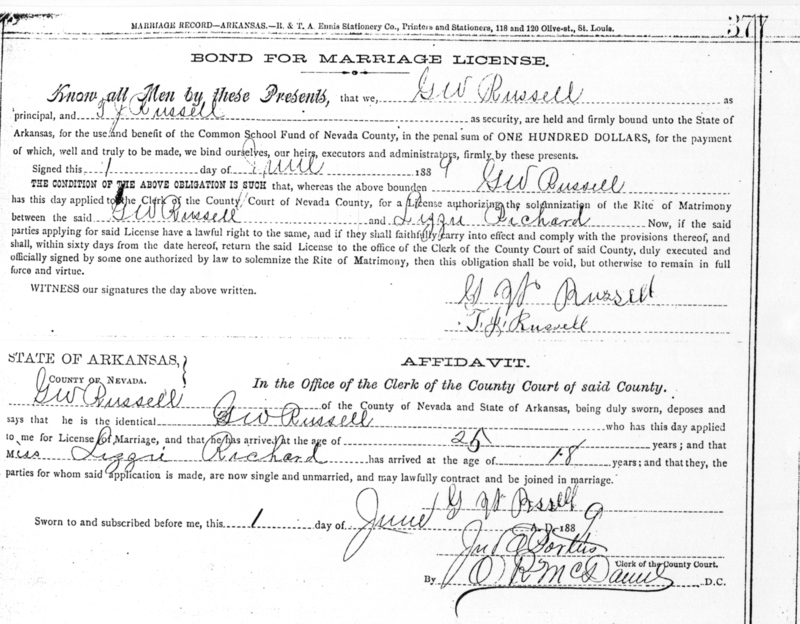 Arkansas Hodnett Marriage Announcements: This page contains announcements for Marvin Hodnet & Nora Hickey, Edwin M. Hodnett & Susan M. Johnson (this Susan M. Johnson might be the daughter of Mary Ann Cooper Hodnett Johnson and William Hiram Johnson), and Thomas Edward Hodnett & Alice Lewis. Click on the link above and scroll down until you find the Hodnetts. Photo of Samuel Lafayette and Lena Augusta Russell Hodnett: Samuel is the son of Thomas E. Hodnett and the grandson of Lafayette Hodnett. Lena is the daugher of George Washington and Elizabeth Richards Russell. Headstone of Samuel L. and Lena Russell Hodnett: Samuel is the son of Thomas Edward Hodnett. His wife, Lena Augusta Russell is the daughter of George Washington and Elizabeth "Lizzie" Richards Russell. Headstone/Cemetery information for George Washington Russell and Elizabeth "Lizzie" Richards: They are buried in the New Hope (formerly called Ebenezer) Cemetery in Nevada County, Arkansas. Photo of George Washington Russell: This photograph is located at Regena Whitten's Web site. Photo of Elizabeth "Lizzie" Richards Russell: Elizabeth married George Washington Russell. Headstone/Cemetery information for William James Russell and Mary Elizabeth Spradley: William and Mary Russell are the parents of George Washington Russell. They are also direct ancestors of former United States President, William Jefferson Clinton. William and Mary are also buried in the New Hope Cemetery. The HOD Net: A site dedicated to members of the Hodnett family throughout the world. The HOD Net also has links to dozens of other Hodnett related websites. The McGehee Family: An excellent Web site for the McGehee family. Most U.S. Hodnetts are probably descended from the McGehees. 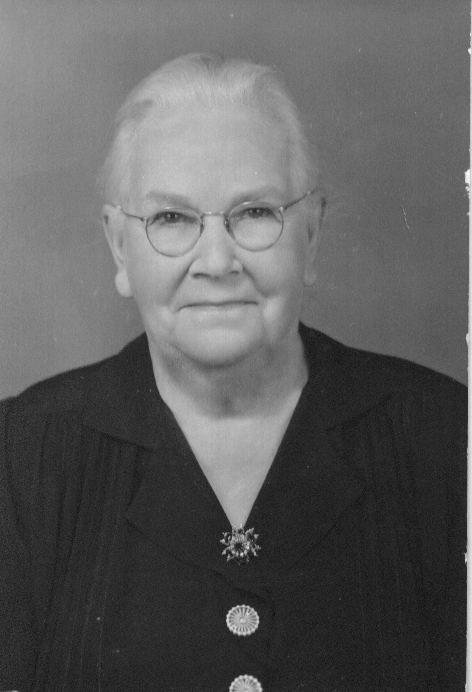 The Life History of Emmi Letty Williams Peterson: This site also has a link to a page containing photos of the old Peterson home in Mapleton, Utah. The Petersons are related to many Hodnetts and Waddells. The Isaac Waddell Family: The Waddells are closely related to many Hodnetts.